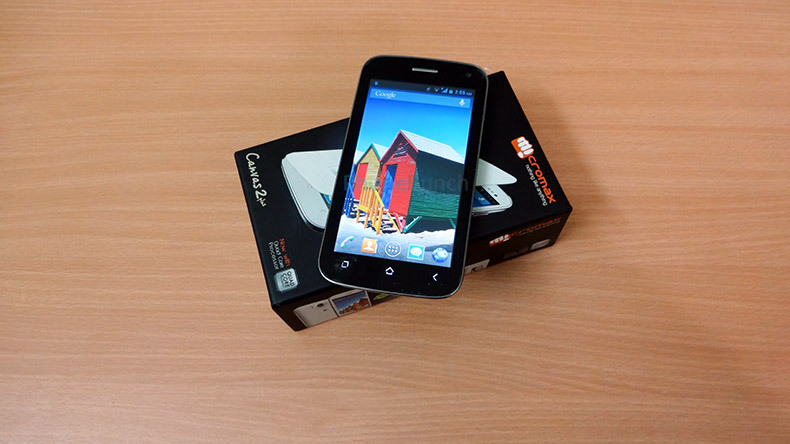 The Micromax A110Q Canvas 2 Plus is the successor of the popular Canvas 2 A110, which solidified the company's presence in India. The Canvas 2 Plus features a 5-inch FWVGA (854x480 pixels) IPS LCD display which has both vibrant colors and great viewing angles. Apart from that the phone is powered by a 1.2 GHz quad-core processor, assisted by 1GB RAM and 4GB expandable internal storage. Micromax A110Q is available for Rs. 11,999 from various online retailers. Apart from the usual accessories, namely, the USB wall-charger, micro USB data-syncing and charging cable, the 2000 mAh battery, headset and the user guides, you also get a black snap-on cover free within the box. The cover replaces the backcover of the device and adds a cover for your display as well. When you first hold the device in your hand, it seems a bit hefty but given that the Canvas 2 Plus has a 5-inch display, it is to be expected. We'd still say it is a bit on the heavier side. There's a chrome trim on the entire device which includes the volume rocker and the power button as well. There are three capacitive buttons at the base of the display , namely Home, Back and the Menu. But the best part about using the Canvas 2 Plus is that Micromax has left the Android 4.2.1 Jelly Bean OS experience as Stock as possible, which is great for future updates as well as performance of the device, which was evident from the fact that the phone booted for the first time in a matter of a few seconds. The phone zips along on every task it is given with its 1.2 GHz quad-core processor, and 1GB RAM. The phone looks good in hand but the flimsy backcover is a bit of a letdown, but that can be just to keep the phone thin and light as well. Nevertheless, we'll be back with a detailed review of the Micromax A110Q Canvas 2 Plus including display, camera samples, benchmarks, gaming review as well as other features. If you have any requests regarding a specific feature of the Canvas 2 Plus or want something particular to be included, just tell us in the comments below.